What’s behind mankind’s deep-rooted urge to explore and push beyond what is known? Mars One—a project aiming to build a permanent human settlement on Mars—announced on May 7 that it had already received 78,000 applications from people seeking to participate in the milestone program. This staggering number of applicants, received in the space of just two weeks, makes it the most applied-for job in human history. Mars One plans to land four people on the Red Planet in 2023 as the first phase of a permanent Martian colony, and to send more astronauts every two years thereafter. Although plans for the colony are still in preliminary phases, the designs show that it may look something like this. But the catch is that participants would spend the rest of their lives in the tiny, tiny colony on Mars, with no chance of ever returning to Earth. It is largely this detail—the permanence of the position—that makes the high number of applicants so significant. 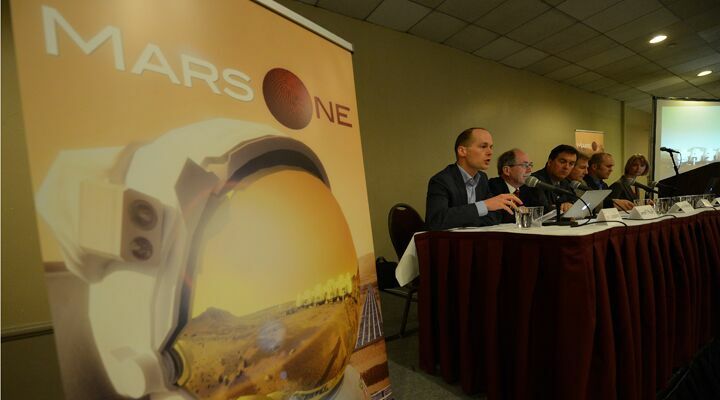 Mars One co-founder Bas Lansdorp said he was surprised by the number of hopefuls. “The fact that we are already at such a significant level in just two weeks time surprised us positively,” he said, explaining that they hope to attract a total of half a million applicants before the deadline. The staggering number of hopefuls takes on even greater significance in light of the application fee, which ranges from $5 to $75 depending on the prosperity of the applicant’s home nation. Why are so many people from so many nations eager to leave Earth forever behind and live out the rest of their lives in the most spartan of circumstances on Mars? The earliest chapters of history show that mankind is imbued with a deep-rooted urge to thrust beyond what is known, and to discover new domains and opportunities. Man’s restless spirit has pushed us to the highest peaks and the deepest ocean depths; sailing to the planet’s every corner and then soaring off Earth altogether. Fame, adventure, escape and myriad other considerations factor into the allure of Mars One and other exploration opportunities. But there is another key aspect of man’s drive to discover. King Solomon said in Ecclesiastes 3:11 that God “has put eternity into man’s heart” (English Standard Version). About this verse, Barnes’ Notes on the Bible says, “God has placed in the inborn constitution of man the capability of conceiving of eternity, the struggle to apprehend the everlasting ….” Our Creator planted within us a longing for something beyond ourselves, something transcendent. It is actually a longing for God, and a desire to realize our potential with Him (though very few presently know anything about the incredible potential mankind has). This jaw-dropping verse, alongside Hebrews 1 and Romans 8, reveals that God designed the whole universe—not just Earth—to be inhabited. He did not create it in vain, just to be an ornament. Of the half a million people expected to apply for Mars One, only four will ultimately be accepted. But each one of those people—and the vast majority of all men who have ever lived—have the potential to go far beyond Mars, and to inhabit the whole universe! Mankind’s ultimate destiny lies out among the stars. To understand more details about this life-changing truth, read Our Awesome Universe Potential. This video offers a glimpse into the awe-inspiring booklet.